The date has been set. You sent out the invitations. You’re having a party. Now there are only a 1000 things that still need to be taken care of before you host your big party. Cue in the panic. Having a party at home always sounds like a fun idea until you start getting into the thick of the planning period from the menu planning to making sure you have enough glassware, there are lot of balls in the air to juggle to ensure that everything turns out just rate. You see, we are taught from a very young age about making first impressions. As we got older, it became ingrained in us that you don’t always get a second chance to make first impression. 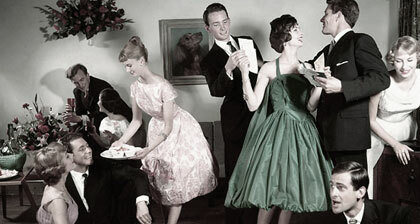 Planning a party can become an overwhelming event, if everything is put off to the last minute. But there’s no need to stress. All it takes is a little bit of organization to get things rolling, without adding any more stress to your everyday life! Followed these simple steps and your party planning process will leave you excited to show your friends family or colleagues what you can do. Four to six weeks before the party! Decide on the day’s activities; what time to eat, what games to play, what crafts to do, etc. If you are ordering your entertainment; get written receipts and read those contracts. Three weeks before the party! Send out invitations; asking for RSVP’s by a certain date and time. If you are sending out digital invitations, make sure you log in regularly to record your RSVP’s. Come up with the menu you’d like and your bar. If you’re using a caterer, call for quotes. If you are using a caterer to supply all your food and beverage, place your order. Confirm your entertainment. If you are using your own playlist, make sure it is ready to go or create one. Call or email all confirmed guests and remind them of the big day, double checking directions. Purchase any last minute food and dessert. Confirm the catering order and give final numbers to caterer. If you are cooking yourself, create a complete grocery list based on your menu. If you are going to use a florist, now is the time to call for quotes and place an order. If you have no helpers, hire someone to help clean clear throughout the party. Prepare your foods ahead of time. If anything can be cooked and reheated, now is the time. Get the house ready and clean and set up the way you want it. Pick up the flowers if you are making your own floral arrangements and organize the vases. Organize suppliers as they arrive (florist, DJ and caterer if using).